Artist David Zvanut has created this concept for a large-scale sculpture in Commerce City Park. The piece uses bois d’arc wood posts suspended in the air from a metal frame, lending an ethereal, curtain-like quality to the recycled objects. Our 2015 Commerce project will be the creation of two massive sculptures in Commerce City Park by artist David Zvanut. 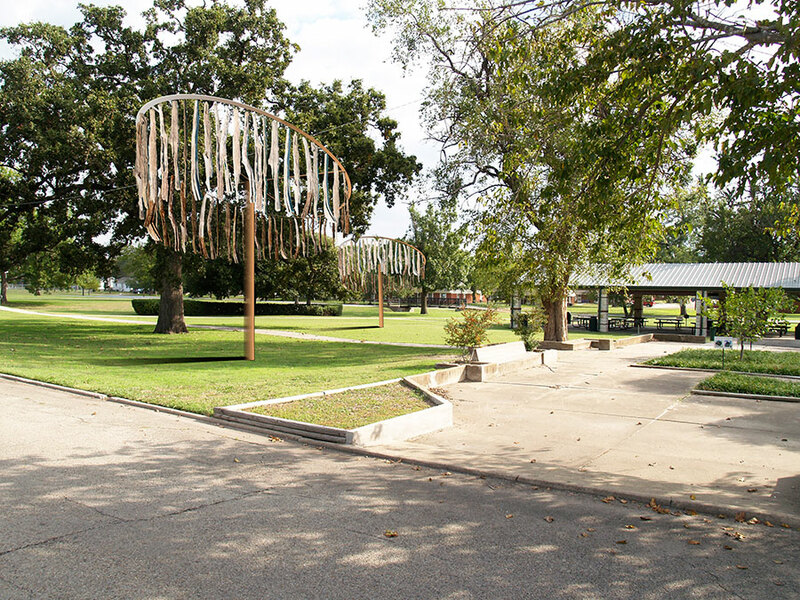 Made from rustic materials including old bois d’arc fence posts suspended from a steel armature, these contemporary sculptures celebrate local history and will draw attention to this longstanding park in central Commerce. The Commerce City Council has passed a resolution supporting the sculpture, which will be built using funds from the Hearts for the Arts Gala fund-raiser on Feb. 7 in Greenville. David Zvanut of Commerce received his MFA from East Texas State University in 1986. His art is held in many private and public collections in Commerce and around the country. His digital photo-collage was chosen for the Catholic Foundation Plaza mural competition in 2009, and a large version of that work now hangs in the Music Building on the TAMU-C Campus. 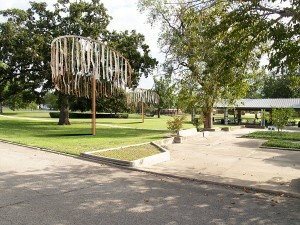 The Northeast Texas Children’s Museum, Cook Children’s Hospital, and the Texas Lottery Commission have commissioned his art. He creates objects in a variety of mediums including paint, clay, glass, and repurposed items in both two and three dimensions. He has worked with bois d’arc posts in many previous sculptures, but this will be the first time he has used this material on such a large scale. Get more information on him at http://zvanut.com.